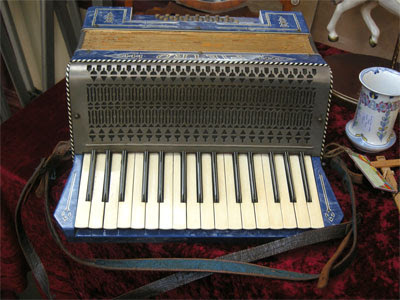 Accordion, £55, from All Our Yesterdays. 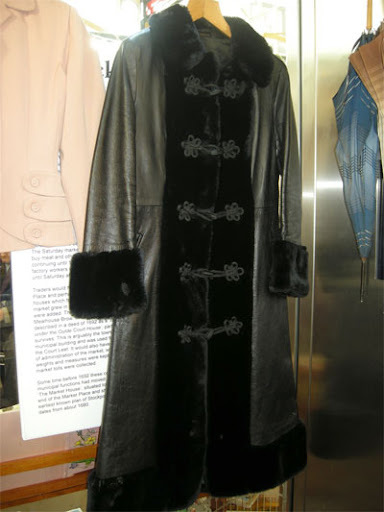 1960s black leather and sheepskin Cossack-style coat, £45, from Graceful & Glorious Vintage. 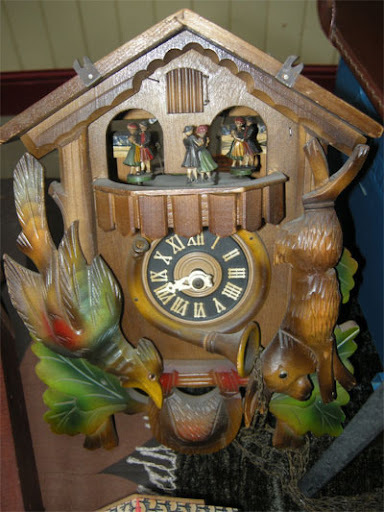 Wooden clock with dancing figures, £25 from Lady, Behave! 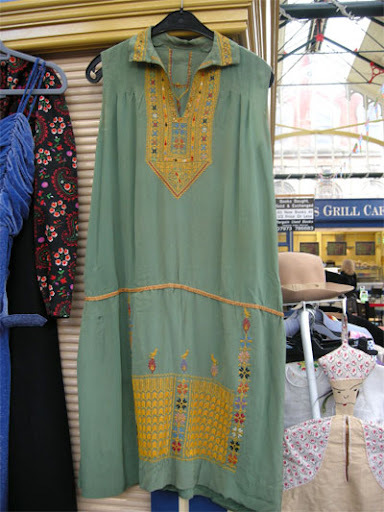 1920s embroidered silk dress, £50 from The Side Room. 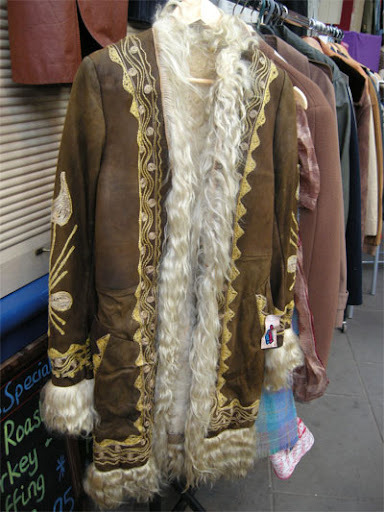 1970s Afghan coat £35, from Village Vintage Clothing. 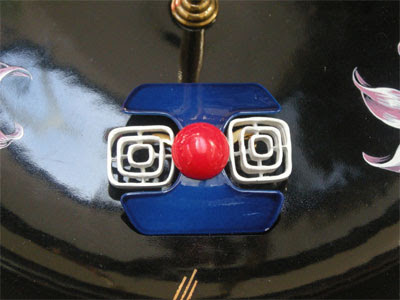 Striking abstract brooch £15, from Look at Lily. 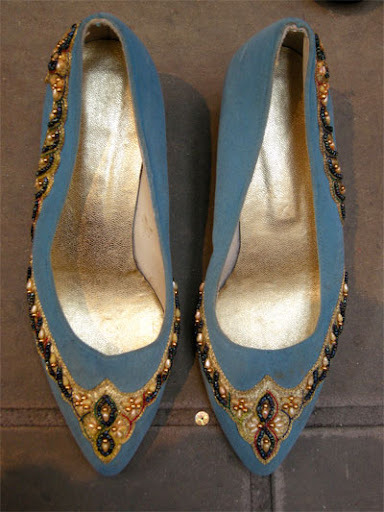 1980s beaded shoes £15, from Pearl & Superfly. 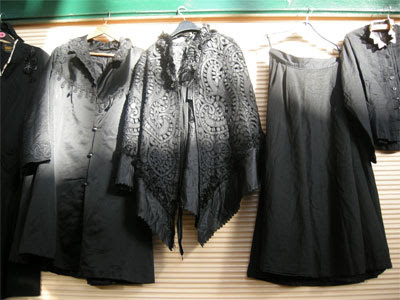 Selection of Victorian and Edwardian garments, mint condition, POA from Graceful & Glorious Vintage. 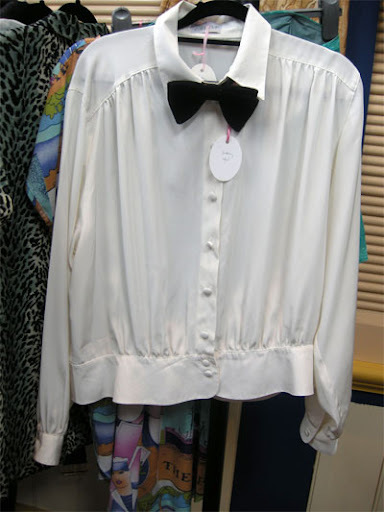 1980s blouse £15, bow tie £7, from Pink Flamingo Vintage Boutique. 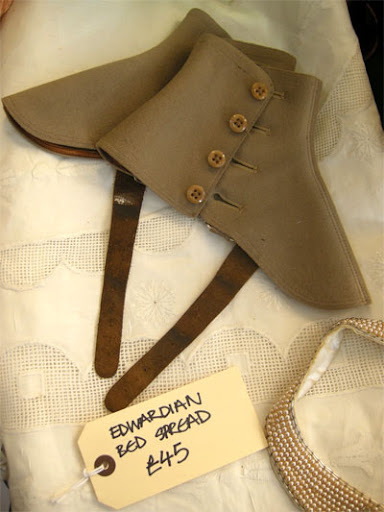 January's Vintage Village saw professional fashion stylist and Salford University lecturer in fashion Elizabeth Cardwell return to make her personal selection of eye-catching finds from the vast array of treasures offered by our stall holders. Even though there weren't quite as many stalls as at our December event, Elizabeth was spoilt for choice and had no difficulty in choosing the wonderful pieces you can see here. In fact, she accomplished this task in double-quick time since she was running late for her little nephew's birthday party. Let's hope Elizabeth didn't get into too much trouble, and our sincere thanks to her for selecting another fabulous array of goodies. 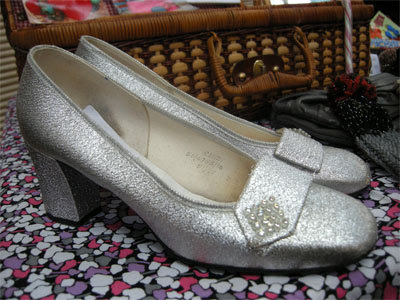 1960s silver lamé evening shoes, £3 (can you believe that??) from Fikle. Spats £15 (and Edwardian bedspread £45) from Victoria's Vintage. 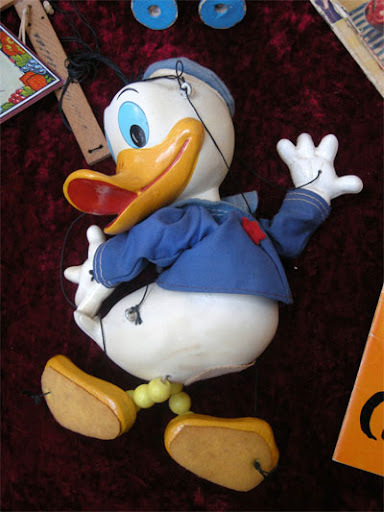 Pelham Donald Duck puppet from All Our Yesterdays. 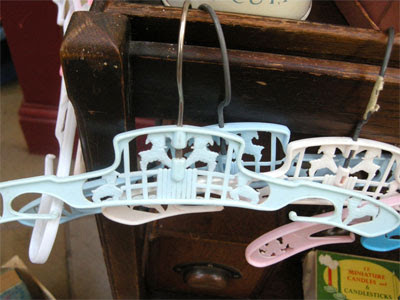 1950s-60s plastic children's coat hangers, 50p each from Agnes Darling. 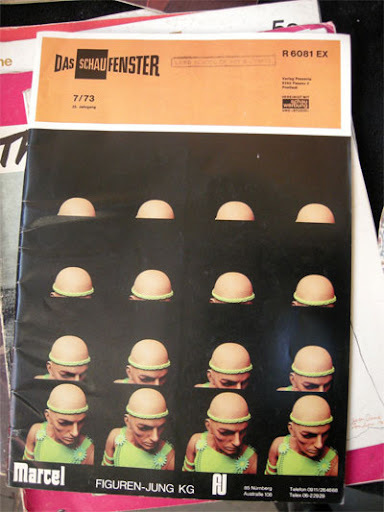 Art and music magazines, from £1 each, from Crystal Angels. 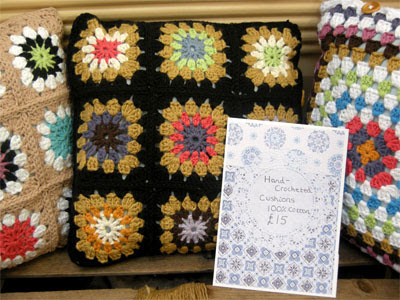 Hand crocheted cotton cushions £15, from Skipping Snail (aka Agnes Darling). 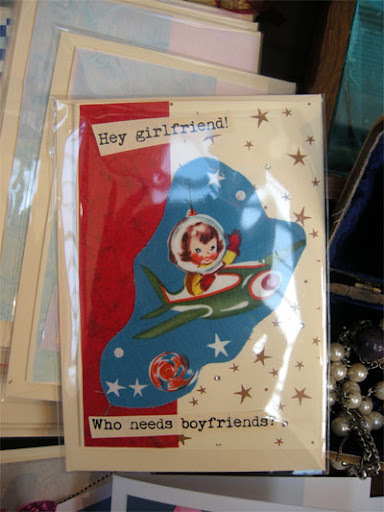 Hand made cards £2, from Butterflies and Bows. 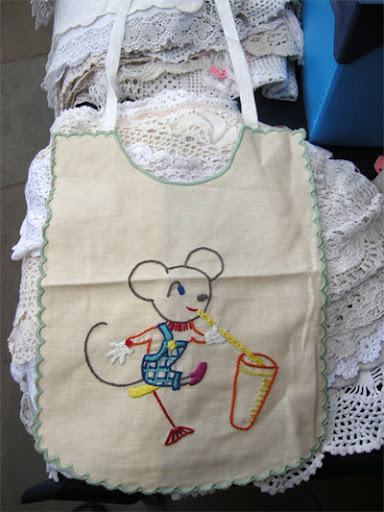 Vintage hand embroidered baby's bib £3, from The Side Room. 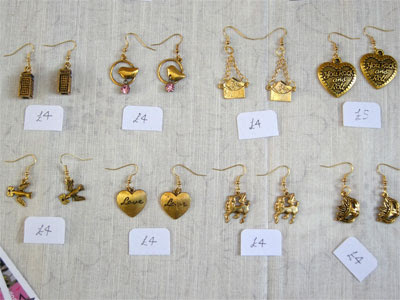 Assorted charm earrings, £4-5, from Toast Rack.